Page 68, Paragraph 8 (Short Stories) is an evocation of Ganymede, or of wine. A waiter, a garçon, the grape, the nuances of red. Hydrangea (Waterworks) is related to Polanski’s Tess, in a way. Bags of blue, sacks of water, a scale. 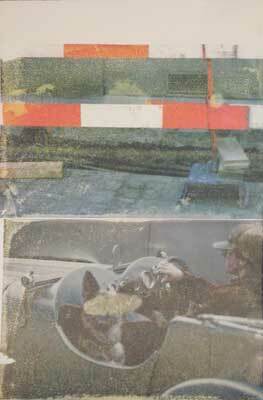 Untitled (Waterworks) is another kind of evocation, traffic bars, driver, something about hydraulics. Many of these works are very large, eight feet by five feet, and are shown to great advantage in the Griffin’s vast, barn-like gallery, with enough space around them to permit an august view.